Add one portion of the size of a tablespoon to waffles, omelettes, pancakes, or any other dessert, according to your own wishes. 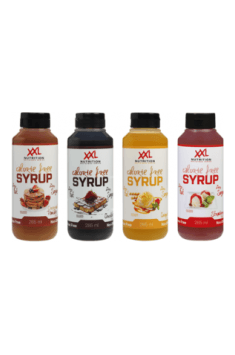 Syrups are a fantastic addition to all types of healthy desserts, which are usually “dry”. It will also prove great in simpler recipes, such as the breakfast king of people on slimming diets – the omelette. Syrups also fantastically fit any type of waffles (rice, buckwheat, millet); the combination with the sauce will make a healthy, low-calorie, sweet snack that can successfully replace a chocolate bar full of sugar and low-quality fats.